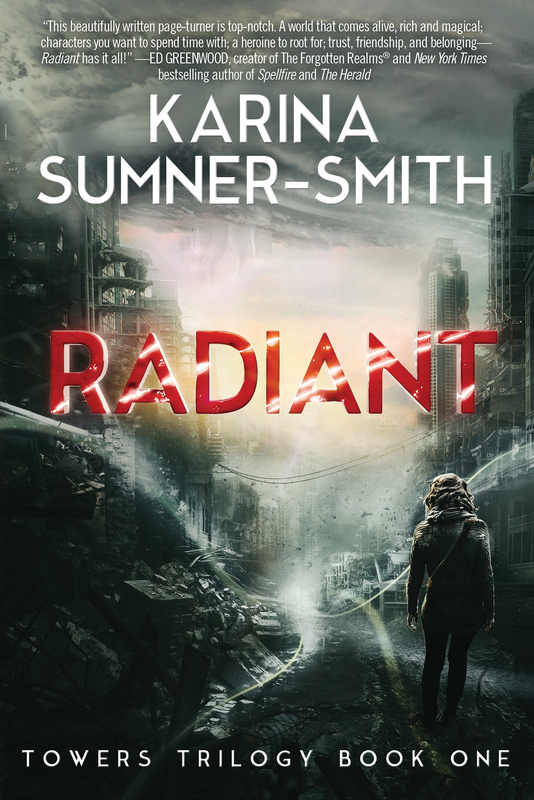 I can’t remember how I first heard of Karina Sumner-Smith’s debut novel Radiant (most likely somewhere on Twitter), but the premise grabbed my attention right away. Even better, the persuasion worked twofold: a clever plot, but also an invitation to a world where a magic system exists alongside urban, paranormal, science fiction, and dystopian elements. Sounds fascinating, doesn’t it? If your answer is “yes,” then Radiant will be a welcome addition to your bookshelf. One of Radiant’s greatest strengths is the fantastic world-building. Despite what seems like a hodge-podge of elements – ghosts, magic, floating Towers above the impoverished Lower City, hovercrafts, ground-to-Tower elevators, night-walkers – Xhea and Shai’s world feels incredibly real. Everything fits the gritty, futuristic setting in tone or image. Sumner-Smith’s evocative writing style also enhances the reader’s experience in the City. It allows readers to picture the crumbling buildings and caving subway tunnels, hear the heavy breathing of the night-walkers (I swore those creatures would give me nightmares), and feel the bumps and shakes of the aircar ride (my favorite scene in the book!). Finally, I appreciated the fresh twists on trite fantasy tropes, particularly how magic is considered a form of wealth because of how commonly it occurs in the City – and how not having magic throws a resident into poverty. Another aspect I enjoyed about Radiant was seeing a friendship between female characters as the primary relationship. This rarely happens in the fantasy genre. At the same time, Xhea and Shai aren’t just two young women gushing about boys, fashion, and superficial subjects. Instead, they’re struggling to protect each other as they navigate their hostile environment and thwart enemies from rival Towers. The fact that Shai’s a ghost – dead, compared to the alive and (literally) kicking Xhea – adds a whole other dynamic. What makes this friendship so believable despite that fantasy “difference” is the balance in personality. The homeless Xhea is plucky, feisty, and tenacious, while Shai retains the innocence, warmth, and grace she must have possessed when living. The two characters motivate each other as a result, and grow from their comradery. One supporting character who intrigued me was Lorn Edren, one of the authority figures of Tower Edren and a man who Xhea rescued in the past. He’s fair and protective toward Xhea, yet the few hints of backstory offered suggest a troubling past. This duality of darkness and light makes me hope we’ll learn more about him as the Towers Trilogy continues and see him play a larger role as a second friend and ally to Xhea. The only downside with Radiant is that it relies too heavily on narrative. Sometimes the story goes on for paragraphs of world-building, thoughts, or description of setting or action before a character speaks again. I think this angle can be justified: Xhea is used to being alone, so she spends chunks of time thinking to herself and observing during Radiant. However, without the normal dialogue-exposition balance, there were times when the pace should have urged my heart to pump with fear but didn’t. It does pick up for the middle and most of the final third, though, so don’t give up on this book too soon. And in hindsight, I’m glad I stuck with Radiant. I came away from it feeling as battered as Xhea did (Sumner-Smith isn’t afraid of making her characters go through hell to achieve their goals) and with wide-eyed wonder. The world that Sumner-Smith has created here is riveting, with its mix of terror and beauty and the stark disparity between the City’s haves and have-nots. Plus, it’s impossible to not root for Xhea and Shai. Radiant allows both characters – especially Xhea – to evolve, and their teamwork is unlike anything I’ve read about before. Fans of adult and YA fantasy shouldn’t let this book slip under their radar. It’s a darkly immersive read with an ending that steals your breath and stays with you for days afterwards. I’m already looking forward to my next ticket to the City when Radiant’s sequel Defiant comes out next year. Oo Radiant definitely sounds intriguing! I feel like I saw it on Edelweiss but wasn’t sure enough to actually request it, ha. I kind of love world-building and friendships beyond all else so I don’t think the heavy descriptions would even bother me 😀 I’ll keep an eye for it on the bookshelves! Awesome! Do you think you’ll write about it at Starships if you end up reading it?